Converting data from an existing CRM system looks like a daunting task. In reality, with sufficient prep, you may be able to do it yourself. If you don’t have time (or your time is better spent elsewhere) there are professionals who can help you. Unless you have a pristine database, proper conversion prep is time consuming. But, don’t defer cleansing the data until after the conversion – the prep time is nothing compared to the effort needed should you postpone cleanup. Take the time to plan and prepare. Clean up and de-duplicate the records. Remove obsolete details and remove or archive old attachments. Document attachments use up storage space: Attachments can often go back for years. Consider the age and relevance of attachments before migrating them. Verify the data exports: Some databases only export the records you specifically request so it’s easy to miss something. Some exports barf before they complete; the export finishes, but it may not capture all the records. Clean house: Merge duplicates and purge old, outdated data before migration. It’s more work to merge or delete duplicates once imported. Custom fields: Create custom fields before you start the import. If not, you’ll need to back out of the migration wizard, create the field, and then start over. 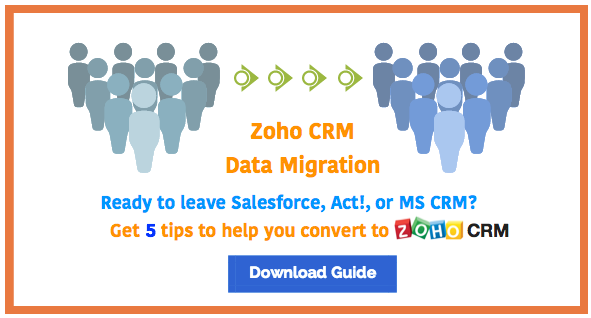 Avoid a do-over “gotcha” – download our data migration cheat sheet. 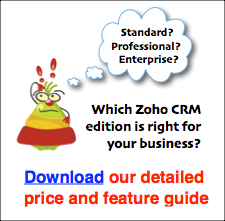 Migration record-type order is critical: The migration wizard lists the Zoho CRM modules in the order in which they should be imported. If you don’t follow the correct order, records will be disconnected. User records go first: To maintain histories, migrate users first. 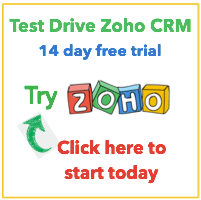 You can do before purchasing and activating their user Zoho accounts. They will be added in deactivated status; just activate them when you’re ready. Field types must match: You can’t import a text field into a decimal field, for example. Date formats: The date format in a CVS file is important. Check the date format in the import file and select the corresponding format in the migration wizard. Avoid a formatting “gotcha” – download our data migration cheat sheet. Required fields: If a mandatory field in a record is empty, the entire record will be skipped. Check your results as you go. Don’t wait until all modules are imported; validate the data after each step. Different databases employ different methods for successfully capturing all records and maintaining their relationships. There are export tools that make this process easier, and there are conversion experts who have the requisite experience and knowledge to get it right the first time. Download our guide with detailed tips, gotchas, and best practices before you begin. Or call 781-606-0433 if you’d like further guidance.